The Jewish Federation of Greater Seattle is on “high alert” after bomb threats directed at synagogues and Jewish schools and centers in at least 12 states. Locally, police are investigating graffiti in Ballard and a phone threat Monday night to a Mercer Island community center. Until the Mercer Island incident, which remains under investigation, most of the anti-Semitic incidents had happened elsewhere. But then there was the discovery over the weekend of what appeared to be anti-Semitic graffiti spray painted on buildings in Ballard. Nancy Greer, president and CEO of the Jewish Federation of Greater Seattle, called the trend disturbing and hurtful. “We’re on high alert,” she said Monday, even before the call that evacuated the Stroum Jewish Community Center (JCC) on Mercer Island. “It’s unfortunate, and I’m hopeful this can’t become the new normal,” she said. A couple of weeks ago, Greer’s staff underwent active-shooter training, part of its ongoing training in how to respond to a variety of threats more than a decade after a gunman opened fire inside the Jewish Federation of Greater Seattle, killing one woman and injuring five others. “Because of our history, we know it’s all too real and all too possible,” she said of the July 26, 2006, shooting by a mentally ill man on an anti-Israel tirade. The federation is a member of SAFE Washington, a network of 100 Jewish organizations that receive real-time updates on threats from local and federal law-enforcement agencies, she said. “Bigoted acts of hatred against any community are acts of hatred against all communities, and we have to work together to dedicate ourselves to fight hatred in all forms,” she said. She knows at least one woman who has a loved one buried in a cemetery outside St. Louis where 200 gravestones were knocked over last week. In Philadelphia, more than 100 headstones were vandalized at Mount Carmel Cemetery, according to The Associated Press. In addition, Jewish Community Centers and day schools in at least a dozen states received threats, according to the JCC Association of North America. Many of the buildings were cleared by early Monday afternoon and had resumed normal operations after no bombs were found. The FBI and the Justice Department’s Civil Rights Division are investigating. “What a sad, sad thing to imagine, for anybody of any religion. It shows a lack of respect for humanity,” Greer said. Locally, Seattle police are investigating what appears to be anti-Semitic graffiti that appeared at three different locations in Ballard, said police spokesman Mark Jamieson. Jamieson said police were notified around 5:30 p.m. Sunday of graffiti that was spray painted on two unoccupied buildings under construction at 28th Avenue Northwest and Northwest 64th Street. Officers were also told of similar graffiti about a block away at 28th Avenue Northwest and Northwest 63rd Street, but by the time police arrived, the building owner had already painted over it, he said. On Monday morning, officers responded to the 2500 block of Northwest 65th Street after someone reported similar graffiti, Jamieson said. The reports have been forwarded to a bias detective for further investigation, he said. 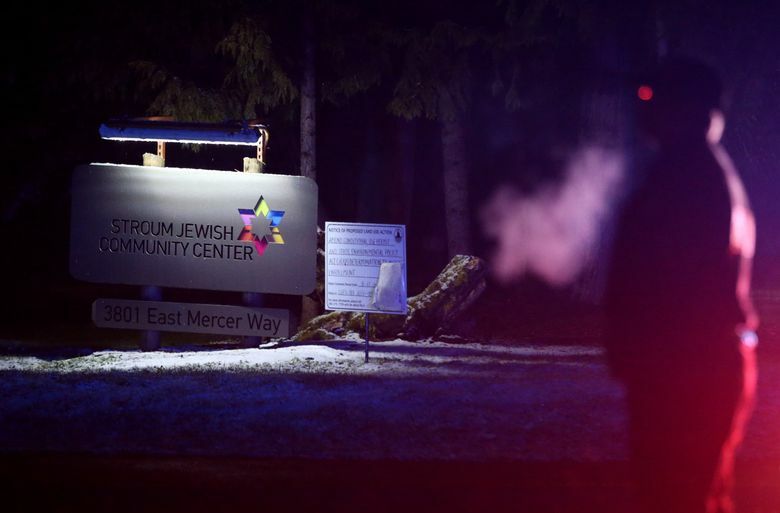 On Monday night the phoned-in threat to the Mercer Island JCC resulted in an evacuation and sweep of the building, said police Cmdr. Leslie Burns. Messages left with the FBI in Seattle were not immediately returned. Over the past month, a number of posters calling for students to join a neo-Nazi group have been plastered outside buildings or appeared on campus billboards at the University of Washington’s Seattle campus. In one incident, the posters were glued to the front doors of the Glenn Hughes Theatre while a play was being performed. She advised students and faculty to report any such incidents to the UW Police. Staff reporters Katherine Long and Mike Carter contributed to this report, which includes information from The Associated Press.